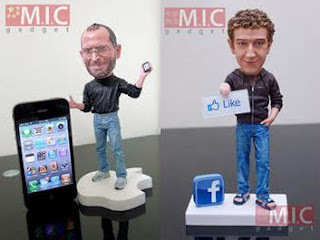 This ZDNet article breaks the news that Facebook CEO Mark Zuckerberg has broken through and now, like Apple CEO Steve Jobs, now has his very own action figure. The 7-inch toy also comes with two buttons and three speech bubbles: you can set the action figure to hold either a Like or Poke button. And just in case you are wondering my birthday is in May.. not that I would want something like this. There is something so weird about this that I really like it. What the world needs is more bobbleheads! I adore your geekiness, Bob, but I don't do bobbleheads.